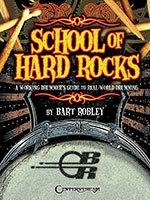 Drummer, session man, teacher and Classic Drummer columnist Bart Robley has compiled the most essential rudiments that form the basis for all of his work. These exercises are not only great for beginners who need a solid foundation, but also perfect refreshers for intermediate to advanced players. By the time drummers are done with this book, their playing will come together into rhythms that can be used in a wide variety of playing situations. 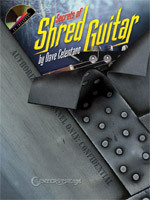 This book/CD teaches beginning to advanced guitarists the secrets of shred. 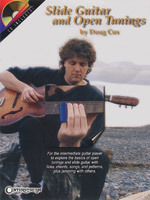 It covers: sweep, alternate and tremolo picking; string skipping; multi-finger tapping; legato, trills and more. The techniques are broken down into 48 exercises and etudes progressing in difficulty, and the CD has examples of each, at regular and slow tempos. Explores the basics of open tunings and slide guitar for the intermediate player, including licks, chords, songs and patterns. This is not just a repertoire book, but rather an approach for guitarists to jam with others, invent their own songs, and understand how to find their way around open tunings with and without a slide. The accompanying CD features 37 tracks. 25 tunes of the era that boosted morale, championed causes, pulled on the heartstrings, or gave impetus to battle. 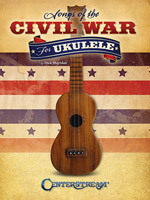 Includes: All Quiet Along the Potomac, Aura Lee, Battle Hymn of the Republic, Dixie, The Girl I left Behind Me. When Johnny Comes Marching Home, and more - All in standard C tuning, with notation, tablature and accompanying lyrics, The book also includes notes on the songs and historical commentary, and a handy chord chart! 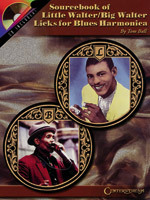 This essential collection for blues harp players sets out to discuss, understand and demystify some of the playing of the phenomenal Walters: the legendary "Big Walter" Horton and "Little Walter" Jacobs. Includes a sampling of the best licks from each artist's repertoire, mapped out in easy-to-read harmonica tablature and played on CD, plus extensive notes on each musician's style, bios and discographies, harmonica basics, notes on amplification and equipment, and much more!